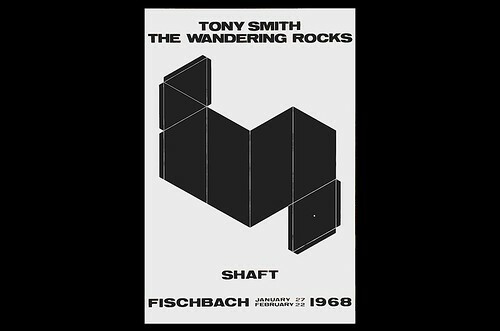 Tony Smith, whose Wandering Rocks (1967-69) is in Lynden’s outdoor sculpture collection, is also represented in our current exhibition, Small Works by Sculptors in the Bradley Family Foundation Collection, by a series of five posters illustrating the polyhedra nets for each of the pieces that make up that sculpture: Crocus, Slide, Dud, Shaft, and Smohawk. Suffering from tuberculosis as a child, the artist spent hours by himself making buildings and miniature cities from small medicine boxes. He returned to that pastime as an adult when recovering from a car accident; it is from this work with geometric solids that some of Smith’s Minimalist vocabulary emerged. Visit the posters in the exhibit and Smith’s work in the garden, then join us to make your own model of Wandering Rocks by cutting, folding, and gluing the images shown in the posters.